In case you’re unsure what this is all about, we’re seeing what team WhatIfSports.com determines is the best Tedford-led team of the six teams he’s coached. I simulate the games, and determine the winner of the series after around forty-fifty simulations. Usually it’s conclusive enough to determine who the winner is after at least 20. Usually. Pretty one-sided so far, hopefully things tighten up in this round. It’s been pretty bland so far. We’ve gotten through the preliminaries of our imaginary little tournament. Now it’s time for the Final Four! Place your bets! First up is inarguably the monster Cal 2004 team, which was dominant in all phases of the game–great QB with good receivers, amazing running attack (and Marshawn was just getting his feet wet as a backup on this team), and one of the most powerful defensive attacks Strawberry Canyon has ever seen (even though it wasn’t the best defense in the conference that year either). Against this, Cal 2007 can offer….um, better punt returning abilities? Barely? Vote your predictions in the poll in the sidebar. Is Cal 2004 running away with this one, or is there an upset in the making? If Game 1 was any indication, this 2007 team might not be here very long. The Cal ’04 team raced to a 31-3 lead and was up by as many as 39 points in a game they led by double digits for over 55 of the 60 minutes. J.J. Arrington ran for 201 yards and 3 TDs, and Aaron Rodgers had an efficient 19-30, 250 yard 2 TD, 1 INT performance. Arrington started off the scoring with a 50 yard scamper, then a quick 3-and-out helped the ’04 team drive for a Lynch 24 yard TD run to make it 14-0. Nate Longshore would drive his team down to the 10 yard line, but three incompletions to Lavelle Hawkins and DeSean Jackson forced a field goal to make it 14-3. The ’07 team would not be able to take advantage of Rodgers’s lone interception, as Jordan Kay hooked his 49 yard field goal wide left. Rodgers would hook up with Garrett Cross to make it 21-3 on the next possession, a Schneider field goal made it 24-3, and a Longshore interception set up another Arrington TD to get the rout going. Longshore would get injured for a brief stretch at the end of the first half, forcing Tedford to settle for a Kay field goal to make it 31-6; his replacement Kevin Riley went 0-1 and was sacked twice on yet another three-and out. Another Kay field goal would make it 31-9, but two more Cal ’04 second half TDs put the game out of reach. Nate Longshore went 24-45 for 301 yards, 2 TDs and an INT, Hawkins and Jackson combined for 11 catches and 146 yards, and Justin Forsett carried the ball 19 times for 143 yards, but the Cal ’07 offense could not convert on their third downs, going 2-13. It was hard for J.J. Arrington to replicate his Game 1 performance. Instead, he did even better. Arrington rushed for 320 yards and 3 TDs and kept the ’04 Bears one step ahead of their ’07 counterparts, maintaining a double digit lead for the entire second half. Arrington would go for over 170 yards including an incredible 74 yard run to put the ’04 Bears up 14-0. All this while overcoming 3 interceptions by Aaron Rodgers in the first half. The ’04 team would dominate the first thirty minutes of football. The ’07 offense struggled to put any points on the board. Two Jordan Kay field goals sailed to the right of the crossbar, and Longshore threw yet another red zone interception, and would go three and out on three possessions. 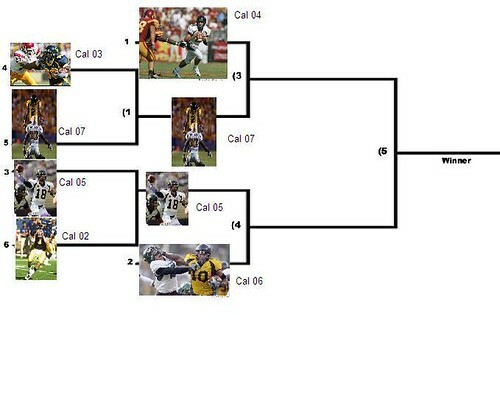 If not for a 58 yard punt return by DeSean Jackson before halftime, Cal ’07 would have been blanked. Up 24-7 going into the second half, Arrington struck again with a 59 yard run which set up a Schneider field goal. After Justin Forsett scored to cut the lead to 27-14, Arrington responded with another 42 yard TD run to up the lead back to 20. When Forsett answered right back with another score on the next drive to make it 34-21, Arrington would score another TD on a 7 yard draw play to make it 41-21 to put Game 2 away. Rodgers struggled early, but settled down to finish 20-31 for 267 yards, 2 TDs and 3 INTs. Nate Longshore was in catchup mode the entire game, going 25-46 for 289 yards, a touchdown and a pick. Overshadowed by Arrington’s brilliance was Forsett’s 29 carry, 177 yard, 2 TD performance. Again a dominating first half and a last ditch effort by the Cal ’07 team could not stop them from taking a dominating 3-0 series lead. The best defense the 2007 team was able to muster and a 188 yard, 1 TD performance of Justin Forsett was squandered by 3 Nate Longshore interceptions, two leading to field goals that provided the final decisive margin. Cal ’07 drove into the red zone four times in the first three quarters, but settled for only two field goals and one Jordan Kay miss. Marshawn Lynch and J.J. Arrington finally had a tough slog against the suddenly resistant ’07 defense in a must-win game, combining for only 79 yards rushing and sacking Aaron Rodgers 5 times, as well as the ’04 team committing 7 penalties to ’07’s zero. But Rodgers still had an efficient 19-28, 230 yard, 2 TD performance that guidied them through the first three quarters. He went 8-10 for 108 yards in the first two ’04 scoring drives, pacing them to a 14-3 lead after one period. Another touchdown to Garrett Cross in the third quarter widened to score to 24-9, and Mixon would pick off Longshore’s next pass to set up a Schneider field goal. After going into the 4th quarter down 27-9, the ’07 Bears finally marshalled their first two touchdown drives. DeSean Jackson returned a punt to the ’04’s 38 yard line, and would catch a TD at the 2 yard line to cut the lead to 27-16, and Forsett then took a pitch right and went 65 yards for a touchdown to cut the lead to 3 (with a Montgomery 2 point conversion). Cal ’07 managed a 3-and-out on defense, got the ball back with 2 minutes left, and drove down to the Cal ’04 red zone with under a minute left in the 4th quarter, but Longshore was picked off on the final possession by Mixon. Longshore finished 28-39 for 278 yards, 1 TD and 3 INT. J.J. Arrington ran for 4 touchdowns in the second half and the 2004 Golden Bears made up a 14 point halftime defecit to sweep the 2007 team out of the tournament and land them in the championship game. Down 28-14 at the half, two of his touchdowns in the middle of the 3rd quarter tied it, and another two in the 4th gave them the lead in the 4th. After a weak first half performance, the ’04 defense only allowed the 2007 team to convert five third downs in the second half. In a second half they needed to win, Cal ’07 could only muster three points to ’04’s 28. This dominating sweep will probably establish the 2004 team as overwhelming favorites in the title round against whoever they face, as they finished off the 2007 team in convincing fashion. A 2007 team that dominated their 2003 counterparts in the series before. After Aaron Rodgers threw a TD to David Gray on the opening drive, he threw a pick to Justin Moye and Tom Schneider missed a field goal. Both times the ’07 team would convert on the two errors to make it a 14-7 lead. Jahvid Best left his imprint on the first half for the ’07 team like Arrington did on the second, running for 79 yards on his only 3 carries including a pair of TD runs of 52 and 12 yards to bring the lead up to 14 at 21-7. Best would also catch Nate Longshore’s second TD throw to make it 28-14 going into halftime, but would surprisingly not see the ball in the second half. Enter Arrington. Although he would pick up about the same amount of yardage in the second half that he did in the first half, he would punch his way into the end zone after a timely 51 yard catch by ’04 Robert Jordan and a short field that only necessitated a 42 yard drive. A 41 yard catch and go by DeSean Jackson set up a go-ahead Jordan Kay field goal, but a methodical 4:27 drive that went 66 yards set up another Arrington TD to put the ’04 Bears up for good, 35-31. A questionable decision to go for it on 4th and 10 at their own 26 with 4 minutes left (with Longshore completing only 2 out of his last 7 passes for 9 yards after the Jackson catch) failed, and Arrington sealed the game with another TD run barely 30 seconds later. A minute drive to 04’s 31 yard line ended in a Longshore sack by Steve Kelly and a Kay missed field goal, and Greg Van Hoesen would sack Longshore on the last drive to finish up matters. Longshore threw 22-45 for 273 yards, 2 TDs, and 1 INT in the second quarter. Aaron Rodgers went 15-26 for 261 yards, 1 TD and 1 INT. So as expected Cal 2004 won, but not so expected was how dominant they were in winning. And I ran that simulator about 50 times. Cal 2007 won twice. Yes, TWICE. Who will win the highly interesting 2005-2006 matchup? You’ll find out soon enough. Topics: Awesome, Cal Football, Irrelevant, Playoffs, Statistics, What If?